Back before Dallas decided to straighten out the Trinity River and move it a mile or two to the west (in an attempt to prevent future flooding), the river ran only about a block from the Old Red Courthouse. It’s so strange looking at this picture and seeing a river in a place where we’ve never seen it. It’s a shame they moved it (who knew you could “move a river”? ), but flooding was a major issue, and, in fact, it looks like there was flooding the day this photo was taken. Below, you can see a magnified view — it looks so different from what we’re used to that it takes a second to get your bearings. Imagine how different Dallas would feel today if the Trinity had been allowed to run its natural course. Photograph by Lloyd M. Long, from the Edwin J. Foscue Map Library, Central University Libraries, Southern Methodist University; it can be seen here (with many of the buildings labeled) and here (without the labeling). SMU has the photo dated “ca. 1930s or 1940s,” but I think it may be from the late ’20s. 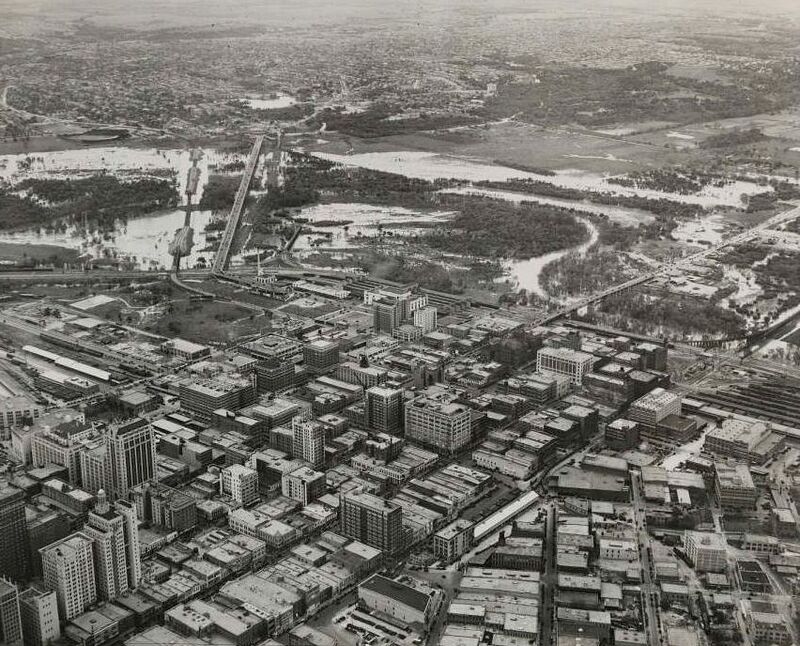 I’ve seen non-specific dates of the river’s realignment from the 1920s to the 1930s, but a couple of landmarks in the photo above place it sometime between 1925 (the year the Santa Fe buildings were constructed) and 1933 (the year the Hippodrome Theater — seen here, on Pacific — became the Joy Theater). UPDATE: The river was straightened in 1928. See fascinating information about the when, where, why, and how of the Trinity River realignment, below in the comments — it was a true feat of modern engineering. A few Trinity River-related links: the Trinity Commons Foundation site is here; the Trinity River Corridor Project site is here; and an interesting look at plans and proposals for the future of Dallas and the Trinity River can be read on the American Institute of Architects (Dallas) site here. Click pictures for much larger images. “In June of 1928, ground breaking for the project took place. 1,000 men at a time were employed on the project. Up to 15 huge dragline machines worked 24 hours a day. Thank you, Peter. Everything about that photo screams 1920s to me. That was a monumental project — those are some staggering numbers. Thanks! pak152, would you mind please posting the details about the book? Or perhaps Paula might want to blog about it. The labeled version of the photograph above identifies feature number 30 as the “YMCA at Union Station.” This is apt to confuse, as the caption should have read “Wye at Union Station.” I’m pretty sure the Wikipedia definition of a railroad Wye will prove more useful here than any attempt by me to define this term. The caption notwithstanding, the photograph and this discussion are interesting and appreciated. Now I know what a “wye” is — thanks, Bob! It appears that Union Station is not yet built. It was constructed in 1916, which would put the date of the photo before that. Paula, for what it’s worth, portions of the old river channel still exist, some of them as simple swales in the area of the I-35/I-30 interchange, and some of them in the form of oxbow lakes in West Dallas. 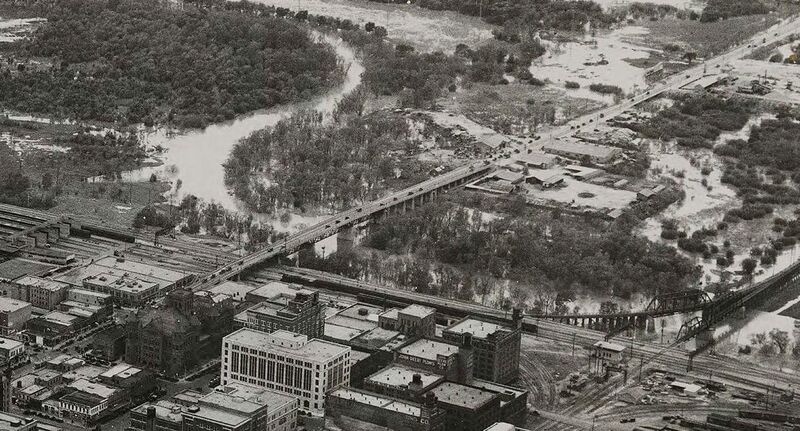 Near downtown the river was east of the present flood plain. In West Dallas it was south of the present flood plain. Even more portions of the old river channel exist in the Mockingbird/Harry Hines area just west of Mockingbird. You drive by it all the time not knowing what it is.